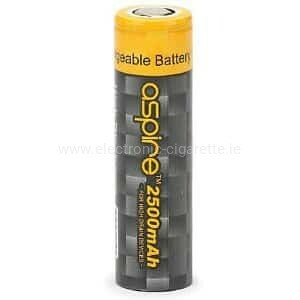 The Aspire ICR 18650 1800mAh Li-Ion high-performance rechargeable battery has been specially developed for use in the sub-ohm range - the large power reserves of this high-quality battery guarantee maximum safety. Note: Lithium cells may only be operated with protective electronics! Safety instructions: Please note that lithium cells may only be used by qualified persons. Incorrect handling or short-circuiting can lead to fire development or explosion. Other features: Lithium-ion batteries are thermally stable and are not subject to any memory effect. They are based on lithium and have a high energy density.